Liverpool did not concede any goal in their last 4 home matches in Premier League. 33% of Liverpool’s conceded goals occurred after the 75th minute in Premier League. Newcastle Utd have failed to win in their last 9 matches in Premier League. 33% of Watford’s conceded goals occurred after the 75th minute in Premier League. 67% of Huddersfield’s matches had under 2.5 goals in Premier League. Huddersfield were losing at halftime in 67% of their matches in Premier League. Liverpool have scored the opening goal in 78% of their matches in Premier League. 78% of Fulham’s matches had over 2.5 goals scored in Premier League. 89% of Wolverhampton’s goals have been scored in the second half in Premier League. Southampton have conceded 2 goals or more in each of their last 3 home matches in Premier League. 75% of Wolverhampton’s conceded goals occured in the first half in Premier League. Newcastle Utd have lost 78% of their matches in Premier League. Wolverhampton have scored 44% of their goals after the 75th minute in Premier League. Southampton have failed to score in their last 4 matches in Premier League. Newcastle Utd have scored 50% of their goals in the first 15 minutes in Premier League. 100% of Liverpool’s conceded goals were conceded away in Premier League. Liverpool have scored 69% of their goals in the first half in Premier League. Fulham have lost 67% of their matches in Premier League. Newcastle Utd have scored 33% of their goals after the 75th minute in Premier League. Liverpool have won 78% of their matches in Premier League. 67% of Bournemouth’s matches had over 2.5 goals scored in Premier League. 42% of Bournemouth’s conceded goals occurred after the 75th minute in Premier League. Leicester City have scored in each of their last 9 matches in Premier League. 78% of Leicester City’s matches had over 2.5 goals scored in Premier League. West Ham Utd have scored 75% of their goals in the first half in Premier League. Huddersfield have lost 67% of their matches in Premier League. Brighton & Hove were losing at halftime in 67% of their matches in Premier League. 89% of Wolverhampton’s matches had under 2.5 goals in Premier League. Liverpool were leading at halftime in 78% of their matches in Premier League. Fulham conceded at least 1 goal in each of their last 9 matches in Premier League. West Ham Utd have lost 67% of their matches in Premier League. 83% of Atalanta’s conceded goals were conceded away in Serie A.
Juventus have scored 2 goals or more in each of their last 4 away matches in Serie A. 82% of Torino’s goals have been scored in the second half in Serie A. 67% of Fiorentina’s matches had under 2.5 goals in Serie A.
Atalanta have failed to score in their last 3 home matches in Serie A. 31% of Empoli’s conceded goals occurred in the first 15 minutes in Serie A.
Juventus have won 89% of their matches in Serie A. 27% of Parma’s conceded goals occurred in the first 15 minutes in Serie A. 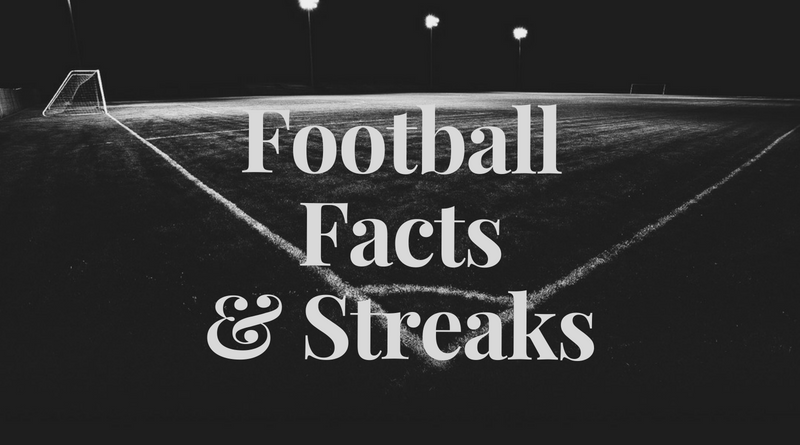 67% of Empoli’s matches had under 2.5 goals in Serie A.
Juventus have been undefeated in their last 9 matches in Serie A.
Juventus have scored in each of their last 9 matches in Serie A.
Empoli have failed to win in their last 8 matches in Serie A. 33% of Atalanta’s conceded goals occurred after the 75th minute in Serie A.
Juventus have been undefeated in their last 4 away matches in Serie A. 43% of Fiorentina’s conceded goals occurred after the 75th minute in Serie A. 67% of Real Sociedad’s matches had over 2.5 goals scored in La Liga. 67% of Athletic Bilbao’s matches ended up in a draw in La Liga. Athletic Bilbao conceded at least 1 goal in each of their last 9 matches in La Liga. Real Sociedad have scored in each of their last 5 away matches in La Liga. Valencia have been undefeated in their last 7 matches in La Liga. 89% of Valencia’s matches had under 2.5 goals in La Liga. 78% of Levante’s matches had over 2.5 goals scored in La Liga. Atletico Madrid have been undefeated in their last 6 matches in La Liga. 89% of Atletico Madrid’s matches had under 2.5 goals in La Liga. Athletic Bilbao conceded at least 1 goal in each of their last 5 home matches in La Liga. 78% of Valencia’s matches ended up in a draw in La Liga. 80% of Atletico Madrid’s conceded goals were conceded away in La Liga. Hoffenheim conceded at least 1 goal in each of their last 8 matches in Bundesliga. Dortmund have won their last 4 matches in Bundesliga. Düsseldorf have conceded 2 goals or more in each of their last 4 matches in Bundesliga. Wolfsburg have failed to win in their last 6 matches in Bundesliga. FSV Mainz have failed to score in their last 5 matches in Bundesliga. Hoffenheim have scored in each of their last 8 matches in Bundesliga. Dortmund have been undefeated in their last 8 matches in Bundesliga. Dortmund have won their last 4 home matches in Bundesliga. Düsseldorf have lost their last 4 matches in Bundesliga. Dortmund have scored 2 goals or more in each of their last 4 matches in Bundesliga. Wolfsburg have conceded 2 goals or more in each of their last 3 matches in Bundesliga. Dortmund have scored 2 goals or more in each of their last 4 home matches in Bundesliga. Monaco have lost their last 4 matches in Ligue 1. Toulouse have scored 40% of their goals after the 75th minute in Ligue 1. Montpellier have been undefeated in their last 9 matches in Ligue 1. Lille have won their last 5 home matches in Ligue 1. Monaco have failed to win in their last 9 matches in Ligue 1. Dijon have scored 50% of their goals after the 75th minute in Ligue 1. 90% of Monaco’s goals have been scored in the second half in Ligue 1. Toulouse have failed to win in their last 6 matches in Ligue 1. Montpellier have scored in each of their last 7 matches in Ligue 1. Monaco have failed to win in their last 5 home matches in Ligue 1. 70% of Lille’s matches had over 2.5 goals scored in Ligue 1. Monaco have conceded 2 goals or more in each of their last 3 matches in Ligue 1. 40% of Monaco’s conceded goals occurred after the 75th minute in Ligue 1. Dijon have lost their last 4 matches in Ligue 1. 80% of Dijon’s goals have been scored in the second half in Ligue 1. 80% of Dijon’s conceded goals occured in the first half in Ligue 1. Lille have scored 2 goals or more in each of their last 3 matches in Ligue 1. Dijon were losing at halftime in 70% of their matches in Ligue 1. Montpellier have scored the opening goal in 80% of their matches in Ligue 1. Montpellier have been undefeated in their last 4 away matches in Ligue 1. Lille have scored 2 goals or more in each of their last 5 home matches in Ligue 1. 70% of Santos’s matches had under 2.5 goals in Serie A (Brazil). Sport Recife have lost their last 10 away matches in Serie A (Brazil). Fluminense have scored in 73% of their away matches in Serie A (Brazil). 32% of Grêmio’s conceded goals occurred in the first 15 minutes in Serie A (Brazil). Sport Recife conceded at least 1 goal in 93% of their away matches in Serie A (Brazil). 77% of Sport Recife’s points have been earned at home in Serie A (Brazil). Sport Recife have lost 80% of their away matches in Serie A (Brazil). Grêmio have been undefeated in their last 10 home matches in Serie A (Brazil). Sport Recife have failed to win in their last 11 away matches in Serie A (Brazil). Sport Recife conceded at least 1 goal in each of their last 10 away matches in Serie A (Brazil). Grêmio have scored 2 goals or more in each of their last 4 home matches in Serie A (Brazil). Sport Recife have conceded 2 goals or more in each of their last 7 away matches in Serie A (Brazil). 79% of Middlesbrough’s matches had under 2.5 goals in Championship. Hull City have failed to win in their last 7 matches in Championship. West Bromwich have scored in 100% of their home matches in Championship. Preston have scored 2 goals or more in each of their last 6 home matches in Championship. Hull City conceded at least 1 goal in each of their last 7 matches in Championship. Sheffield Wed conceded at least 1 goal in each of their last 14 matches in Championship. Middlesbrough did not concede any goal in 86% of their home matches in Championship. 27% of Derby County’s conceded goals occurred in the first 15 minutes in Championship. Middlesbrough have failed to score in 43% of their home matches in Championship. Derby County have scored in 71% of their away matches in Championship. Birmingham City have been undefeated in their last 10 matches in Championship. Sheffield Wed have scored in 71% of their away matches in Championship. Bolton conceded at least 1 goal in 71% of their home matches in Championship. Birmingham City conceded at least 1 goal in 71% of their home matches in Championship. Sheffield Wed conceded at least 1 goal in 100% of their away matches in Championship. Bolton have failed to score in 43% of their home matches in Championship. Hull City have conceded the opening goal in 71% of their matches in Championship. Middlesbrough have failed to score in their last 3 home matches in Championship. Hull City have lost 71% of their away matches in Championship. Rotherham have failed to win in their last 7 matches in Championship. 71% of Rotherham’s matches had under 2.5 goals in Championship. Hull City have lost their last 5 away matches in Championship. West Bromwich conceded at least 1 goal in 86% of their home matches in Championship. 75% of West Bromwich’s goals have been scored in the second half in Championship. 42% of Blackburn’s conceded goals occurred after the 75th minute in Championship. Preston conceded at least 1 goal in 71% of their home matches in Championship. 46% of Birmingham City’s conceded goals occurred after the 75th minute in Championship. 79% of Sheffield Wed’s matches had over 2.5 goals scored in Championship. Bolton have lost 57% of their home matches in Championship. Hull City conceded at least 1 goal in 100% of their away matches in Championship. 85% of Preston’s points have been earned at home in Championship. Preston have scored 39% of their goals after the 75th minute in Championship. 36% of Preston’s conceded goals occurred after the 75th minute in Championship. 92% of Rotherham’s points have been earned at home in Championship. Rotherham have scored 80% of their goals at home in Championship. 80% of Rotherham’s goals have been scored in the second half in Championship. West Bromwich have scored 34% of their goals after the 75th minute in Championship. Blackburn have scored in 86% of their away matches in Championship. Rotherham have lost 86% of their away matches in Championship. Wycombe have scored 35% of their goals after the 75th minute in League One. Wimbledon have lost their last 5 matches in League One. Charlton have scored in each of their last 9 matches in League One. Coventry City have won their last 4 matches in League One. Doncaster conceded at least 1 goal in 100% of their away matches in League One. Wycombe conceded at least 1 goal in 100% of their away matches in League One. Walsall have failed to score in 50% of their home matches in League One. 64% of Walsall’s points have been earned away in League One. Walsall have scored 67% of their goals away in League One. 41% of Walsall’s conceded goals occurred after the 75th minute in League One. Wycombe have scored in 71% of their away matches in League One. Wimbledon conceded at least 1 goal in 86% of their home matches in League One. 64% of Wimbledon’s points have been earned away in League One. Wimbledon have lost 67% of their matches in League One. 68% of Luton Town’s conceded goals occured in the first half in League One. Luton Town have scored 2 goals or more in each of their last 6 matches in League One. Coventry City have scored 71% of their goals away in League One. 71% of Coventry City’s goals have been scored in the second half in League One. Coventry City have scored 35% of their goals after the 75th minute in League One. Doncaster have scored in 71% of their away matches in League One. 80% of Rochdale’s matches had over 2.5 goals scored in League One. Wimbledon conceded at least 1 goal in each of their last 6 home matches in League One. 80% of Luton Town’s points have been earned at home in League One. Rochdale conceded at least 1 goal in 71% of their home matches in League One. 75% of Rochdale’s points have been earned away in League One. Rochdale have scored 62% of their goals away in League One. Wimbledon have lost 71% of their home matches in League One. Luton Town have scored 72% of their goals at home in League One. Rochdale were losing at halftime in 60% of their matches in League One. Charlton have scored in each of their last 6 away matches in League One. Rochdale have lost 71% of their home matches in League One. Doncaster conceded at least 1 goal in each of their last 10 matches in League One. 67% of Wycombe’s points have been earned at home in League One. Wimbledon conceded at least 1 goal in each of their last 8 matches in League One. Rochdale have scored 33% of their goals after the 75th minute in League One. Charlton have scored in 100% of their away matches in League One. Wimbledon have conceded 2 goals or more in each of their last 3 matches in League One. Luton Town have scored in 71% of their away matches in League One. Charlton have scored 2 goals or more in each of their last 4 away matches in League One. 47% of Charlton’s conceded goals occurred after the 75th minute in League One. Dalkurd conceded at least 1 goal in 77% of their home matches in Allsvenskan. Hacken have been undefeated in their last 6 matches in Allsvenskan. Dalkurd have lost 54% of their home matches in Allsvenskan. 66% of Hacken’s points have been earned at home in Allsvenskan. Hacken have scored 71% of their goals at home in Allsvenskan. St Johnstone have scored 38% of their goals after the 75th minute in Premiership. St Mirren have lost their last 4 matches in Premiership. 38% of Kilmarnock’s conceded goals occurred in the first 15 minutes in Premiership. Hamilton have conceded 2 goals or more in each of their last 3 matches in Premiership. Kilmarnock have won their last 4 matches in Premiership. St Mirren have failed to win in their last 8 matches in Premiership. 79% of St Mirren’s conceded goals occured in the first half in Premiership. St Mirren were losing at halftime in 67% of their matches in Premiership. 75% of Kilmarnock’s conceded goals occured in the first half in Premiership. St Mirren have lost 78% of their matches in Premiership. Hamilton have lost 78% of their matches in Premiership. St Mirren have lost their last 4 away matches in Premiership. Kilmarnock have scored 2 goals or more in each of their last 6 matches in Premiership. St Mirren have conceded 2 goals or more in each of their last 4 away matches in Premiership. St Mirren have scored 40% of their goals in the first 15 minutes in Premiership. Hamilton were losing at halftime in 56% of their matches in Premiership. 26% of St Mirren’s conceded goals occurred in the first 15 minutes in Premiership. St Mirren have scored 40% of their goals after the 75th minute in Premiership.